The Walt Disney Studios has announced the May 22nd release of the Studio Ghibli film The Secret World of Arrietty, which broke the Ghibli record for a North American theatrical release with $18.6 million. Anime grandmaster Hayao Miyazaki wrote the screenplay for Arrietty, which is based on Mary Norton’s children’s classic The Borrowers, but Miyazaki didn’t direct the film, leaving that task to Hiromasa Yonebayashi, a talented animator who made his directorial debut on Arrietty. Since Miyazaki’s Ghibli releases have typically been the bestselling anime home entertainment release in North America of whatever year in which they appear, The Secret World of Arrietty, which will be available in a 2-disc Blu-Ray/Combo (MSRP $39.99) as well as a single-disc DVD version ($29.99), will likely take “Top Anime” release of 2012. 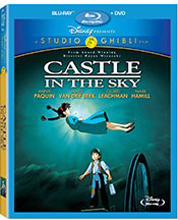 Also on May 22nd Disney is releasing the first high-def Blu-ray versions of two other Ghibli films including, most notably, Castle in the Sky (Laputa), one of Miyazaki’s very best films, which will be available in a 2-disc Blu-ray for an M.S.R.P. of $39.99. Castle in the Sky is one the great anime classics and it has never looked better than in its new Blu-ray edition. The other film debuting on Blu-ray is Whisper of the Heart (Mimi o Sumaseba), a brilliant, but lesser known Ghibli film from 1995 that Miyazaki wrote (adapting a manga by Aoi Hiragi), but did not direct (Yoshifumi Kondo helmed the film). Whisper of the Heart is also available in a two-disc Blu-ray edition for an M.S.R.P. of $39.99.